My child has just been diagnosed with autism, how do I cope with this? Recently I received an email from a mother whose child had just been diagnosed with autism. She was in pain, and she wanted to know how she was supposed to carry on; she felt all alone. What I told her was that there are moments in time that are forever etched in your memory- for example – I will never forget the moment I heard President John F. Kennedy had been assassinated. Most Americans will never forget what they were doing on September 11, 2001 when they heard that the Twin Towers in NYC were hit by planes and were going down. For a parent, the day you receive your child’s diagnosis of autism is the same – you will never forget where you were, how you were told and what feelings overcame you. The difference is, that you feel all alone in your pain – it is not a national catastrophe, but a personal one that impacts you just as deeply. When you leave the doctor’s office, you are all alone in your pain. Unlike a national catastrophe, everyone else’s life continues on just the same – only you, your spouse’s and your family’s life has changed. Even if you expected the results because you felt something was wrong with your child, nothing prepares you for hearing the official diagnosis, and for the slew of emotions that follow. It is awful. However, it is important to remember at this time, that you are not alone. There are many parents out there who went through what you are going through, or are going through it now, and connecting to them can be your lifeline. They will understand what those close to you may not. You will get autism parenting tips from them. At first you may be reluctant to contact the autism organizations or attend support group meetings – it is kind of like joining a club you never wanted to be a member of. However, getting to know other parents you can talk to who understand what you are going through is very helpful. Of course, you would rather have heard that nothing was wrong with your child. A parent goes through many emotions at this time. It is important to focus on the positive aspect that now that you know what is wrong, you can move forward, when you are ready, to find the treatments, therapies and strategies that will help your child. Once you are ready, you will need to get educated about autism. We can help you do that at Autism College. Our free Library will have information you can use. You may find our Parent Empowerment Course useful. Or, how about my books, Autism Spectrum Disorders, and 41 Things to Know About Autism. In my next post, I’ll provide some useful tips for parents new to autism wanting to know how to cope. 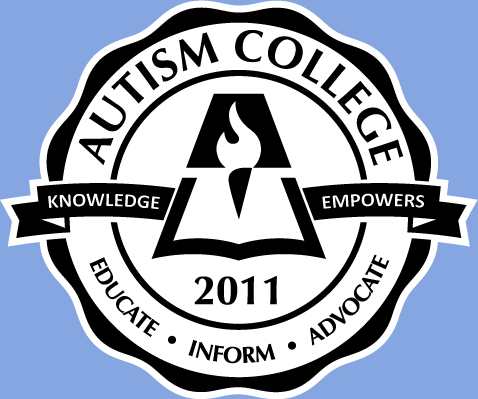 Autism College is happy to announce that to celebrate Autism Awareness Month and the launch of this site we are co-sponsoring a free virtual conference “Get Educated About Autism” with momsfightingautism.com on Saturday April 9th and Sunday April 10th. I’m thrilled to announce that Temple Grandin, one of Autism College’s visiting professors, has agreed to be one of our keynote speakers. We will have 16 different speakers, with a couple of different tracks. There will be different experts who will be providing autism parenting tips, and helping parents cope with autism. Educators will find the information useful as well. Oh – did I tell you it’s FREE? Register for the conference here (Sign Up Page Official goes live on March 7).